Erectile Dysfunction is common and can be caused by many factors from simply having a very stressful day to complex chronic conditions such as poor heart health. Erectile Dysfunction treatments vary, and Riverside Village Pharmacy in Nashville, Tennessee offers several discreet, affordable ED treatment options at great prices, shipped to your door. 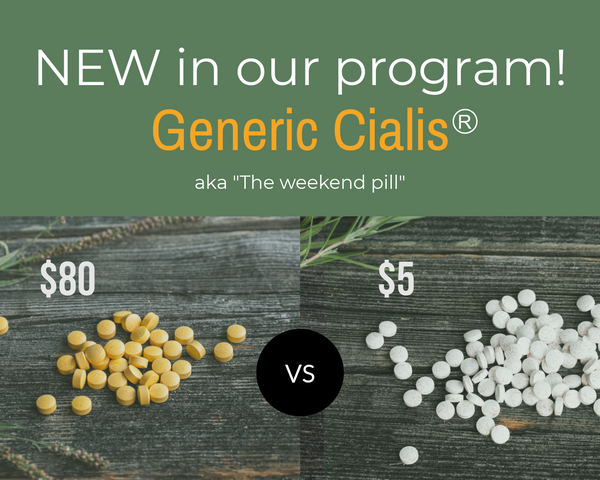 Generic Cialis is sometimes called "The Weekend Pill," because it's available in your system a bit longer than Viagra (up to 36 hours). If you're interested in buying Generic Cialis, our full-strength 20mg tablets are available with incredible prices and FREE shipping. Need a prescription for Generic Cialis or a prescription for our other Erectile Dysfunction medications? We connect you to an online appointment right on your PHONE. NO insurance needed No prescription? ONLINE appointment available for $49 (includes initial Rx, if approved, and refill). No wait. No office. Contact us below and we'll get you started. Click here for more information on our Generic Viagra program.